I don’t know if Roseanne’s writers, producers, and cast realized how much they had riding on the season-10 finale, but “Knee Deep” is the closest the show has come to firing on all cylinders since “Dress To Impress.” The episode is a solid effort from director Gail Mancuso, who takes us through a besieged Lanford, and writer Bruce Rasmussen, who also penned the second episode of the revival. Season 10's been a bumpy ride, and while “Knee Deep” isn’t perfect, it’s one of the better examples of what the show still has to offer. When Darlene and Harris sit down to talk about their future again—a nice bookend to their discussion in “Roseanne Gets The Chair”—their optimism could represent the hopes of the people behind the revival. “Knee Deep” is tasked with wrapping two main arcs—Roseanne’s ailing knee (which requires surgery) and Darlene’s struggle to provide for her two kids while not entirely giving up on her own dreams. The solutions “Knee Deep” offers to these problems are an ocean apart in terms of realism, but still feel true to the sitcom format, as well as the spirit of the Conner family. Darlene’s growing awareness of her severely limited options, along with her heartfelt conversations with Becky—who, true to form, cheerfully informed her sister of how fucked they all are—have offered some of the most poignant moments in the revival. Darlene’s professional disillusionment mirrors the devastation Becky’s encountered in her personal life, and whenever the two sisters have had a chance to delve into their similarities, the revival has taken off. But though I still feel Harris has been underwritten, Darlene’s also had some moving moments with her daughter. When Harris finds her mom, who’s accepted that she’ll have to write around her casino-server schedule, typing late into the night, the teen drops the sarcastic front to support her. There’s some good-natured ribbing in there, because the apple hasn’t fallen far from the tree. But we get to see how well Sara Gilbert, who’s expertly portrayed Darlene’s quiet disappointment and renewed tenacity, plays off Emma Kenney. Here, they display the kind of laidback bond Darlene said she wanted to establish with her kids. But the revival continues to struggle with giving its new characters adequate screen time; the spotlight on Harris leaves the other kids in the periphery. Mary is briefly wowed by her dad D.J.’s attempts at a magic act, but the writers are still coasting on Jayden Rey’s adorableness. Mark shows up in a handful of scenes, but the closest thing he gets to a storyline or character development is the tired assumption that someone who doesn’t read as traditionally masculine is bad at sports. I acknowledge the time constraints that prevented all the characters from getting their due attention, but Mark has been given no other identifiable qualities beyond being gender-nonconforming. Not all characters are received equally, even if they get plenty of screen time, but the writers haven’t given the new kids on the block much of a chance to win anyone over. They’ve established a hierarchy, one that’s placed the older Conners at the top, and in doing so, sold one of the generations in this multigenerational household short. But now that the introductions are out of the way, the writers have a chance to expand the roles of younger Conners and Conner-Healys in season 11, which I hope they do. 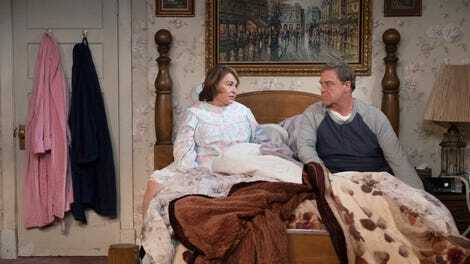 Roseanne and Dan’s conundrum is more dramatically portrayed, which is in stark contrast to the wave of a wand (in this case, FEMA’s) that resolves it, but a lot of difficult choices precede their happy ending. Dan screws over his best friend and employee Chuck in order to underbid the other contractors in Lanford. John Goodman hasn’t always been entirely present this season, but here he demonstrates just how torn Dan is about his decision—he can’t quite look Chuckie in the eye. And when he says he’s been hanging on his fingertips his whole life, the always more optimistic half of the Conner marriage actually sounds defeated. This makes the wait for the deus ex machina even tenser. Roseanne and Jackie try to sell Bev’s antique doll to French Stewart to get the money for the surgery, only to discover just how tiny their inheritance is. All avenues seemingly exhausted, everyone gathers in the Conners’ living room with the possessions they’ve deemed worthy of saving, which are, naturally, their Halloween decorations. Just as it looks like everyone’s going to move in with Jackie and Bev—just kidding, you know Bev would never allow that—the news breaks (via tweet, of course) that the president has declared a state of emergency in Illinois due to all the flooding. Their problems are mostly solved, as Dan figures he can repair the house for less than whatever they get from FEMA, which somehow leaves enough money for Roseanne’s surgery. 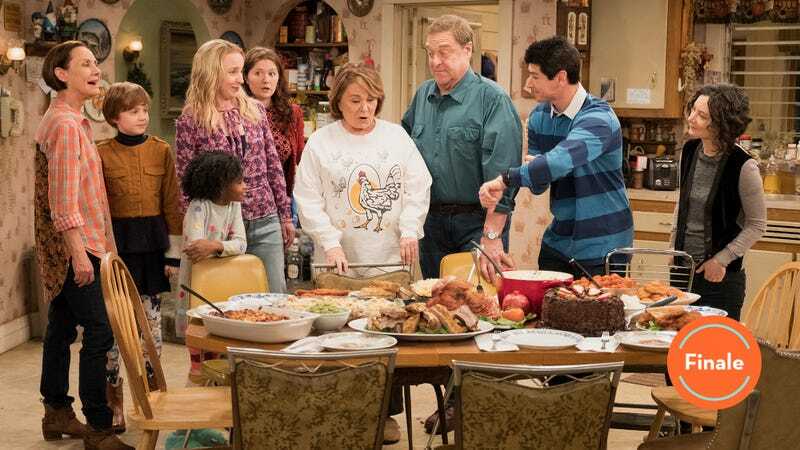 What follows is a huge feast that Roseanne has seven—now six—minutes to enjoy, and a prime opportunity for Roseanne to make good on its promises. “Knee Deep”’s ending is awfully convenient—I admittedly don’t know much about how FEMA funds are dispersed, but pocketing leftover money seems a bit of a stretch. But the conclusion is also the stuff that sitcoms are made of, putting a pin on roughly 22 minutes of alternately humorous and dire circumstances. The lead up to the end is where Roseanne really shines, though; Darlene and Becky trading shots and solutions without parental advice (which probably wouldn’t be welcome anyway) shows how much they’ve grown, which also means growing into themselves. We see how Darlene carries that into her relationship with her daughter Harris (not so much with Mark this time around). Dan’s storyline, meanwhile, is a nuanced payoff to the previous discussions about undocumented workers and exploitative labor practices. With his back to the wall, Dan was prepared to do something he was just railing against. The season finale effectively resets the series, with the Conners (hyphenates included) roughly where they started, which is way behind. There’s been some improvement in their situations, though: Darlene will get some belated parenting help from David, Jackie and Bev have worked out some of their issues, Becky is no longer locked in her grief, and Roseanne learned that she can tolerate one Muslim family at a time, especially if she has a chance to borrow their wifi. Okay, so those aren’t all winners, but maybe the latter is the most we can hope for right now. The revival regularly struggled with balancing all the characters and objectives, but maybe now that the Conner family has been reintroduced, the new generation will have its time in the sun in the 11th season. If so, Darlene can and should lead the way. She and Gilbert have proven to be the linchpins in their respective ensembles, and though I doubt Roseanne Barr is going anywhere, Roseanne is at its best when the focus is on the former. The Conner matriarch still has some affecting moments with Dan, but the stories this season proved that the most nuanced discussions happen away from the loudest voice in the room/on set. Now if the writers would just train their ears—and pens or laptops—elsewhere. Oh, I’m already haunted by Bev writing a journal for her doll. I imagine this is how Annabelle got her start. Um, I’m worried about Bev—maybe Jackie’s place is on an upper floor, but it still seemed odd to leave her to fend for herself. I didn’t catch French Stewart’s character’s name, but “French Stewart” does sound like a good name for the owner of an antique shop. Michael Fishman didn’t show out much this season, but he managed to recapture D.J.’s goofy charm during that magic act. Finally, thanks for reading and commenting. We’ll have a Crosstalk about the finale up tomorrow morning, in case you can’t get enough of “Knee Deep” here.